Wednesdays are my “off” days. My daughter has a job in town and after I drop her off, I usually can go shopping by myself or spend some “me” time doing whatever I want. Except this Wednesday, our youngest son NEEDED some gym shoes and we used the time to shoe shop. His foot grew an entire size and he only had small flip flops. I had put off this chore long enough. Bye bye alone time. We had 3 hours before we had to pick up his sister. I thought we had plenty of time with maybe some to spare, right?! 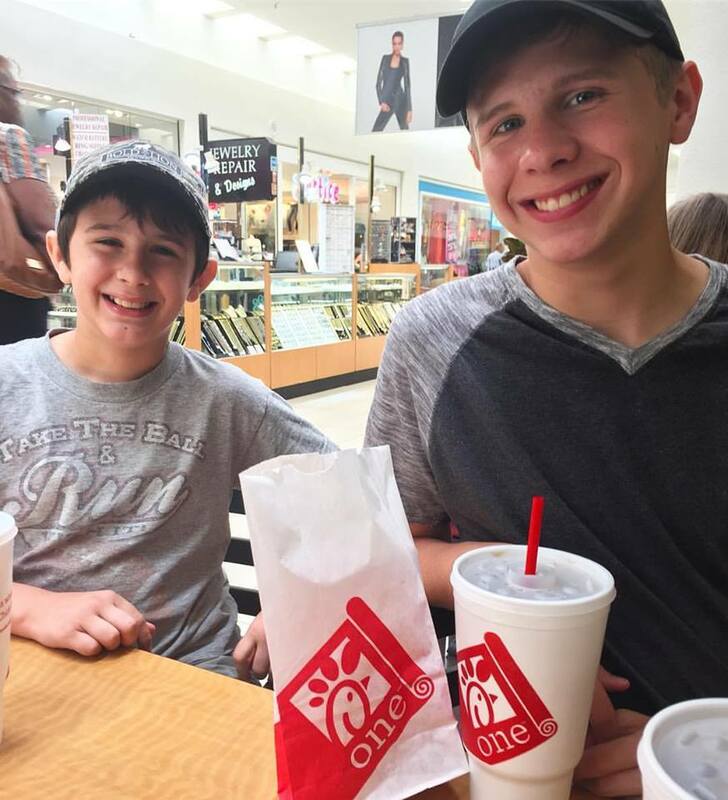 However, we did get to stop by Chick-Fil-A for an energy booster! Do you have the Chick-fil-A app ONE on your phone? This month they are giving away a free breakfast treat to all who have the app. YUM! He wears size 5 in a youth, we thought. No one hardly carries the size 5 shoe. I guess they skip it thinking kids don’t really need it. OR maybe they were all bought in the back to school rush. Either way…we couldn’t find them. We went to 16 stores. 16! I’m not exaggerating! 16 – we counted! 16 stores and only 2 carried size 5 in youth. We finally thought we found the PERFECT store! Oh blessed ACADEMY!!! Why did I not go there to begin our journey? Except, he needed a half size bigger. And they didn’t have it in the store. I am NOT going to the 17th store! My daughter shared my sentiments! It could only be classified as “parent abuse” at this point in time. I thought at any moment, movie cameras would come around the corner and say we were being pranked! Seriously, why would everyone not sell this size? What did I do when my other boys were in this size?! They probably wore flip flops! Let me tell you what Academy did! They allowed me to pay IN the shoe department without having to go to the register and had the shoes shipped free to our house! Can you say – customer for life for this guy’s shoes?! Thank you Mr. Academy for this honor of shopping in your store, free shipping and not allowing me to have a complete Mommy meltdown in the little boy’s shoe aisle! A short 3 hour tour turned into 8 LONG hours for one very cool size 5.5 pair of gym shoes. I feel ya’ Gilligan! Or was that a 4 hour tour?! Nothing says love more than “shoe shopping” with our loves. Been married over 25 years and that was our first real date. 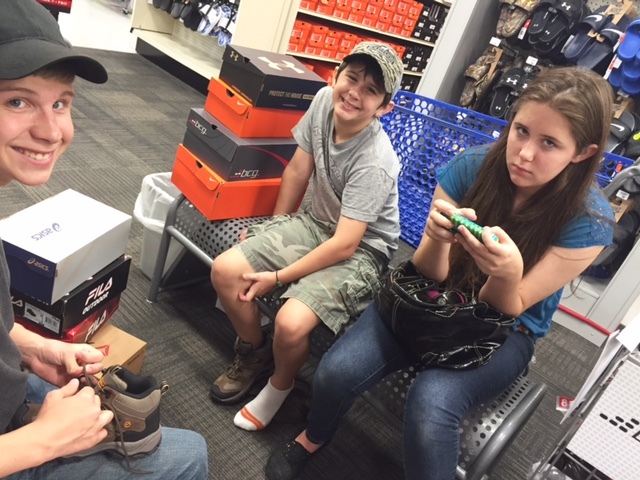 It was a tearful event with little ones (that would one day call me Mom) in tow not knowing who the strange lady that was with Dad was and why she would even want to shop for shoes with us? But 25 years later – we are family and so thankful! Memories of shoe shopping are endless. Hunting daughters that think it fun to hide in a major department store….. tears because they are too expensive or the wrong color (oh, that was me). It’s a place of bonding for sure. Thank you for sharing your story and now I know the apple does not fall far from the tree! Way to go Momma, keep doing the hard things, you are making eternal differences and great stories for future blogs! You are a rare treasure and yes one of my greatest blessings!